The DSSH is a very active Society, with Newsletters, Linkedin groups, a Twitter account @dutchsimulation, a Facebook-page and the DSSH Congress! The core activities of the Society are aimed at supporting the development and implementation of Simulation and ‘Serious Gaming’ in Healthcare; thus promoting patient safety, evidence-based education, team-training, and overall quality in healthcare. 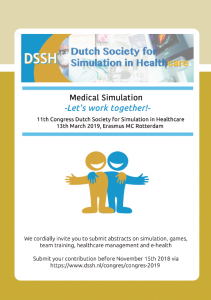 In Spring, the DSSH hosts the DSSH Congress, with an accent on interactive Workshops, Simulation and Serious Gaming for health care professionals. In Fall, the DSSH is Scientific Partner of the Games for Health Europe Congress, with an accent on Serious Gaming.